Looking for something to do this weekend? 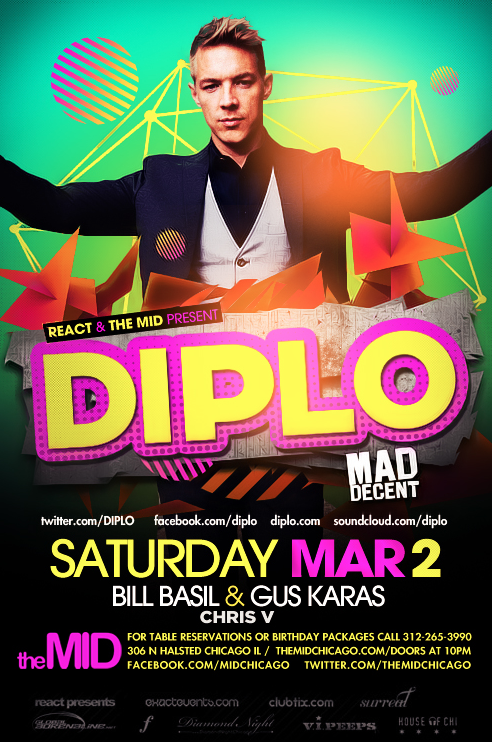 Kick it college-style at the Mid on Saturday night with Diplo. The man who founded record label Mad Decent and made the hashtag #expressyourself go viral, Diplo has also created some very impressive remixes- Usher’s “Climax” is among them. Anyone who caught Diplo’s set at the inaugural Spring Awakening Music Festival, or the after party at the House of Blues last summer knows that this man does not mess around when it comes his DJ sets. Known internationally as a curator amongst the world’s most cutting edge DJs, producers, and musical movements, Wesley Pentz, better known as DIPLO, is one of the most successful, diverse, and open minded DJs and producers in the world.